Hey everyone! This year I’ve been trying to get better and have an actual skincare routine. While my face might be an oil well, the rest of my skin is super dry. I don’t have a specific body wash or lotion that I have to use, but I recently came across this body scrub and thought I should give it a try. 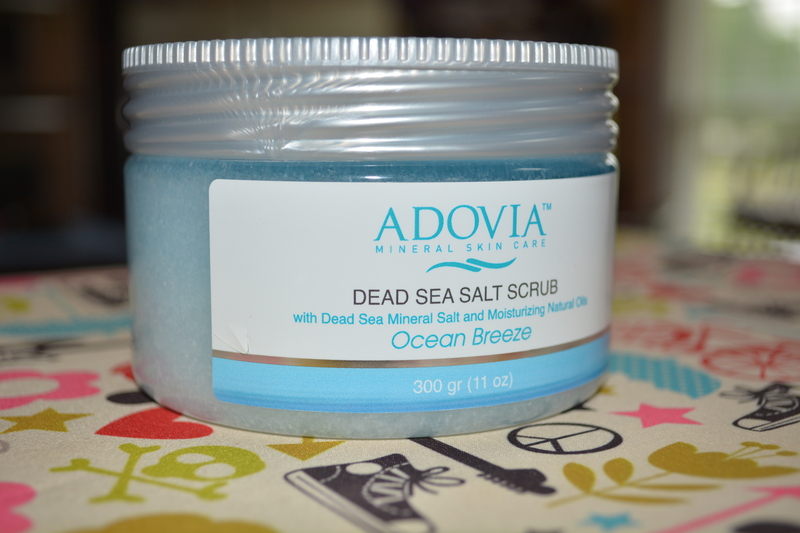 For the past two weeks, I’ve been using the Adovia Dead Sea Salt Scrub in Ocean Breeze. * It comes in an 11-ounce container and has a fair amount of product in it. At first I figured it would be like any body scrub and thought I would only use it for a day or two and then get over it. But I actually really enjoyed it! 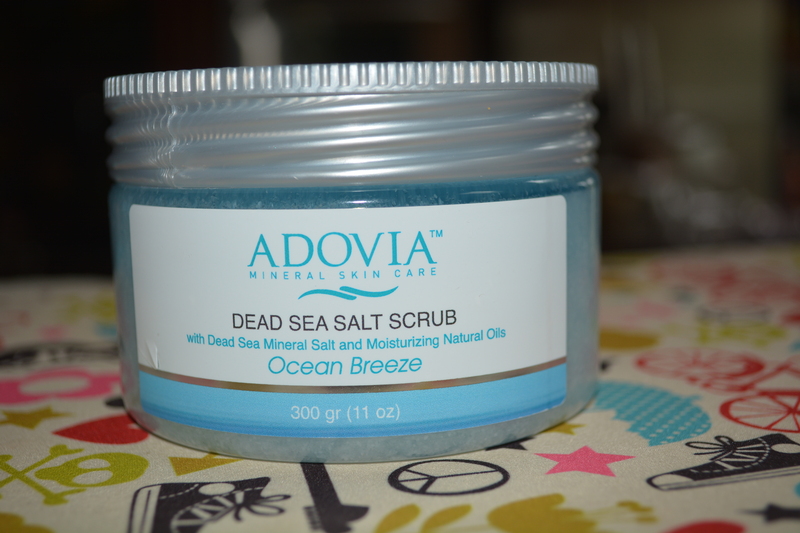 The brand, Adovia, is a skin care line that uses natural ingredients like minerals, antioxidants and herbs, in order to create safe and effective products. They claim that their products work to restore the skin’s natural balance to give you smoother, healthier and younger looking skin. This scrub in particular is supposed to exfoliate dead skin cells and deeply moisturize your skin. This “spa-like” treatment also has aloe vera, avocado oil, jojoba oil and sweet almond oil, all working toward moisturizing and rejuvenating the skin. There is a strong scent to this scrub so if you aren’t into that, you might want to pass on this product. However, it is an enjoyable scent – for me, it reminds me of an Indian store…. don’t know why, but it smells so good! The scrub is finely milled so you only need a small amount to get the job done! The particles are easy to rub in and didn’t irritate my skin. I use this scrub two to three times a week in the shower. I really work on scrubbing it in, especially on the soles of my feet, knees and elbows. It glides on smoothly and leaves my skin feeling moisturized. I’ve actually noticed a difference in my skin too – it isn’t as dry anymore! And the hydrating effects on the skin don’t vanish after a few hours. I find my skin feeling fresh and smooth for the rest of the day, and sometimes into the next day as well. Overall, I really liked this product! And for the price (currently $14.95 on Amazon), I think this is a great bargain. You can also get it at Cleopatra’s Choice. You only need a small dollop of the scrub so this tub should last a while! Have you all tried other products from this line? Let me know in the comments! *Disclaimer: This post was sponsored by Adovia and Brand Backer and contains my honest and unbiased opinions. I received this scrub from the company in exchange for an honest review.